My friend Miriam Kairey can not only professionally trace your family history back at least ten generations, but she can also teach us all how to roast the perfect kosher turkey for Thanksgiving. She is a gourmet cook and is author of the cookbook Positively Passover. She makes Syrian “kaak” regularly and is committed to preserving the art of cooking Syrian Jewish Cuisine. Although Thanksgiving turkey is not exactly a Syrian main dish, Miriam has perfected her turkey roasting technique and I asked her to share it with all of us Jewish Hostesses! Thanks Miriam!! “Thanksgiving is a big deal in the Kairey house. It is a great opportunity to invite family and friends who live too far to walk over on Jewish Holy Days. On this day we set aside the rich culinary tradition of the Syrian Jews in favor of delicious dishes that are quintessentially American. The key to capturing the essence of these flavors is to use an abundant supply of fresh herbs including parsley, sage, rosemary and thyme, just like the Simon and Garfunkel song. There is no shortage of Thanksgiving recipes on the web. Besides The Jewish Hostess, I also recommend Martha Stewart as a reliable source. Just be sure to add plenty of chopped parsley and sage leaves to your stuffing, and sprinkle rosemary leaves on top of your sweet potatoes before cooking. Reserve the stems to use when making turkey stock. A foil roaster will deliver a turkey that takes longer to roast and is drier. 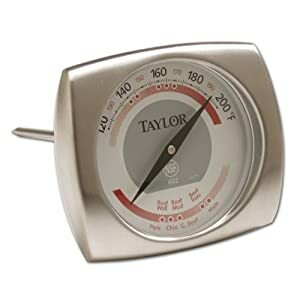 Make sure you have a meat thermometer (check out Taylor Elite 602 Meat Roasting Thermometer from Amazon). Take the turkey out of the oven the minute it is cooked, otherwise the breast dries out and shreds when you try to carve it. If you purchase a frozen turkey, put it in the fridge to defrost on Sunday or Monday, clean and season it on Wednesday, and it will be ready to stuff and roast on Thanksgiving day. The day before Thanksgiving, make a paste of garlic, paprika, salt, pepper and oil in a food processor . Rub completely over turkey inside and out. Lift the skin on the breast and rub the paste underneath the skin directly onto the breast. Tuck several bay leaves under skin as well. If turkey is not completely defrosted yet don’t worry. Put turkey in an oven bag and scatter remaining bay leaves, onion and thyme (stems included) all around the bird. Close bag and refrigerate overnight. Thanksgiving day heat oven to 325. Calculate 20 minutes per pound, and you will arrive at the approximate roasting time. Then you can decide what time you need to put the turkey in the oven. With turkey still in bag place stuffing inside the cavity of turkey. Twist bag closed put in roaster and cover. It cover does not close completely its ok, because the turkey is in a bag. Once roasting is well under way, I remove turkey from oven every 20 minutes or so, unwrap the bag, and baste turkey. About 1 hour from finish time I cut away the bag so the turkey can get a golden brown color. Now you will want to start checking the temperature by inserting meat thermometer between the thigh and breast, but not touching the bone. When temp reaches 165, remove bird from oven. It will continue to cook even after leaving oven. Discard Thyme. Wait 20 minutes, carve and serve immediately. 2 Tbs. fresh ginger, grated. Place all ingredients in food processor and pulse until finely chopped. Do not puree.